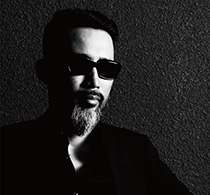 DJ / Creative director of KYOTO JAZZ MASSIVE and of TOKYO CROSSOVER/JAZZ FESTIVAL. Since forming "KYOTO JAZZ MASSIVE" as a DJ unit in the beginning of 90's, they have built up the Crossover/Jazz Music scene in Japan, and have successful careers overseas. In 2000 KYOTO JAZZ MASSIVE signed to COMPOST RECORDS in Germany and released their first single "ECLIPSE /SILENT MESSENGER" from the label. After it’s release, the track made number one in the BBC RADIO ONE ZUBB CHART and was highly acclaimed worldwide. In the same year, they released their second single "SUBSTREAM" which was also met with praise. In 2002 they released their much awaited first album "SPIRIT OF THE SUN" worldwide. The album was a success and is still today one of the most inspirational works to many DJs in the Crossover/Jazz scene. In 2006 Shuya Okino released his first solo album "UNITED LEGENDS". He invited ten vocalists and ten producers to contribute to the album for which he composed all tracks. This album is remarkable as it was made by only communicating using Email, this unprecedented technique of making music has made it of special interest to the music scene. One of his most important works as a music selector is a compilation CD for the stylish design hotel "CLASKA" in Meguro, Tokyo. Another side of Shuya Okino’s career is as a music writer. He has written a book and is currently working on another on the subject of DJing in the Club Jazz scene. His first book was published in 2005 and is in it’s fourth published edition. Shuya Okino appeared on iTunes CELEBRITY PLAYLIST and was the first Japanese artist ever to achieve this. He has also selected music for NIKE+iPod and recently produced music for RISONA BANK in TOKYO MID TOWN, Tokyo. As a DJ, Shuya Okino regularly tours Japan and worldwide. He has played a number of times throughout Europe and America. DJing at THE JAZZ CAFE and NOTTINGHILL ART’S CLUB, London, A.P.T, New York, SOUTHPORT WEEKENDER JAZZ FESTIVAL, FUTURE JAZZ FESTIVAL, Croatia to name a few. Shuya Okino continues to be an important figure in the Crossover/Jazz scene worldwide and his work is influential and inspirational to many members of the club music world. ・ "Especial Records Session presents KYOTO JAZZ MASSIVE"
@THE ROOM. Shibuya - Every month first Saturday.